Philip of Anjou is proclaimed Philip V of Spain on 16 November 1700 at Versailles. By the end of 1706, Allied victories in Italy and the Low Countries forced the French back within their borders but they were unable to make a decisive breakthrough. Control of the sea allowed the Allies to conduct successful offensives in Spain, but lack of popular support for Archduke Charles meant they could not hold territory outside the coastal areas. In 1665 Charles II became the last male Habsburg King of Spain; suffering from ill-health all his life, his death was anticipated almost from birth and his successor debated for decades. In 1670, England agreed to support the rights of Louis XIV to the Spanish throne in the Treaty of Dover, while the terms of the 1688 Grand Alliance committed England and the Dutch Republic to back Leopold. In 1700, the Spanish Empire included possessions in Italy, the Spanish Netherlands, the Philippines and the Americas and though no longer the dominant great power, it remained largely intact. Since acquisition of the Empire by either the Austrian Habsburgs or French Bourbons would change the balance of power in Europe, its inheritance led to a war that involved most of the European powers. The 1700-1721 Great Northern War is considered a connected conflict, since it impacted the involvement of states such as Sweden, Saxony, Denmark–Norway and Russia. During the 1688–1697 Nine Years War, armies had increased in size from an average of 25,000 in 1648 to over 100,000 by 1697, a level unsustainable for pre-industrial economies. The 1690s also marked the lowest point of the Little Ice Age, a period of colder and wetter weather that drastically reduced crop yields. The Great Famine of 1695-1697 killed between 15-25% of the population in present-day Scotland, Estonia, Finland, Latvia, Norway and Sweden, with an estimated two million deaths in France and Northern Italy. The 1697 Treaty of Ryswick was therefore the result of mutual exhaustion and Louis XIV's acceptance that France could not achieve its objectives without allies. Leopold initially refused to sign and did so with extreme reluctance in October 1697; by now, Charles' health was clearly failing and with the Succession unresolved, the signatories viewed Ryswick as a pause in hostilities. Unlike France or Austria, the Crown of Spain could be inherited through the female line. This allowed Charles' sisters Maria Theresa (1638–1683) and Margaret Theresa (1651–1673) to pass their rights as rulers onto the children of their respective marriages with Louis XIV and Emperor Leopold. Despite being opponents in the recent Nine Years War, Louis XIV and William III of England now attempted to resolve the Succession by diplomacy. 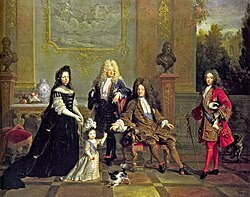 In 1685, Maria Antonia (1669–1692), daughter of Leopold and Margaret, married Maximillian Emanuel of Bavaria and they had a son, Joseph Ferdinand. The 1698 Treaty of the Hague or First Partition Treaty between France, Britain [d] and the Dutch Republic made the six year old heir to the bulk of the Spanish Monarchy and divided its European territories between France and Austria. The Spanish refused to accept the division of their Empire and on 14 November 1698, Charles published his Will, making Joseph Ferdinand heir to an independent and undivided Spanish monarchy. When he died of smallpox in February 1699, a new solution was required; this was provided by his mother Maria Antonia, who in 1685 transferred her claim to the Spanish throne to Leopold's sons, Joseph and Archduke Charles. This was of doubtful legality but France, Britain and the Netherlands used it to devise the 1700 Treaty of London; Archduke Charles became the new heir, with Spanish possessions in Europe split between France, Savoy and Austria. Leopold refused to agree the provisions of the Treaty giving France most of Italy while Spain continued to insist on an undivided monarchy. Charles amended his Will in favour of Archduke Charles but on 2 October, replaced him with Louis' grandson Philip, Duke of Anjou. If Philip refused, his younger brother, the duc de Berry was next, followed by Archduke Charles. Charles died on 1 November 1700 and Louis received the offer on 9th, giving him the option to accept or insist on the Treaty of London. The latter would in theory give the throne to Archduke Charles but if Leopold continued to refuse the territorial concessions, Louis could demand Britain and the Dutch join him in enforcing the Treaty, leaving Austria isolated. However, French diplomats advised the anti-French mood of the Habsburg court meant war either way, while Britain and the Dutch would neither fight for nor against Austria. On balance, this made it preferable to accept the offer and on 16 November, Philip of Anjou was proclaimed Philip V of Spain. With most of his objectives achieved by diplomacy, Louis now made a series of moves that combined to make war inevitable. The Tory majority in the English Parliament would not fight for Spain or the Dutch and preferred the provisions of Charles' will to the Partition Treaties. [e] However, a foreign diplomat observed this was true 'so long as English commerce does not suffer.' Louis either failed to appreciate this or decided to ignore it and his actions gradually eroded Tory opposition. In early 1701, Louis registered Philip's claim to the French throne with the Paris Parlement, raising the possibility of union with Spain, contrary to Charles' will. In February, the Spanish-controlled Duchies of Milan and Mantua in Northern Italy announced their support for Philip and accepted French troops. Combined with efforts to build an alliance between France and Imperial German states in Swabia and Franconia, these were challenges Leopold could not ignore. At the same time, French garrisons took over Dutch-held 'Barrier' fortresses in the Spanish Netherlands, helped by the Spanish Viceroy and French ally Max Emanuel of Bavaria. This undid Dutch gains made at Ryswick and threatened their lucrative monopoly over the Scheldt granted by the 1648 Peace of Münster. It was also a concern to English merchants since control of the ports of Antwerp and Ostend allowed France to blockade the Channel at will. Combined with other French actions potentially damaging to English trade, this produced a clear majority for war and in May 1701, Parliament urged William to negotiate an anti-French alliance. On 7 September, Leopold, the Dutch Republic and Britain[f] signed the Treaty of The Hague renewing the 1689 Grand Alliance. Its provisions included securing the Dutch Barrier in the Spanish Netherlands, the Protestant succession in England and Scotland and an independent Spain but made no reference to placing Archduke Charles on the Spanish throne. War became inevitable when the exiled James II of England died on 16 September and Louis reneged on his earlier recognition of the Protestant William III as his successor to the thrones of England and Scotland. Instead Louis supported the claim of the Catholic James Francis Edward Stuart. When William died in March 1702, his successor Queen Anne confirmed her continuation of the Protestant succession. The Dutch did the same and on 15 May the Grand Alliance declared war on France, followed by the Imperial Diet on 30 September. France's central position required the Grand Alliance to attack on multiple fronts and divide its substantial military resources. Economic: The importance of trade and economic interests to the participants is often under estimated; contemporaries viewed Dutch and English support for the Habsburg cause as primarily driven by a desire for access to the Spanish American markets. 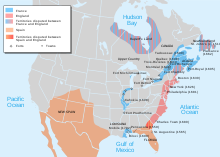 The commercial aspects led to the war expanding beyond Europe into North America, as well as India and Asia. Modern economics generally assumes a constantly growing market whereas the then dominant theory of Mercantilism viewed it as static. As a result, increasing your share of trade implied taking it from someone else, with the government's role being to restrict foreign competition. Trade was often used as a policy weapon; between 1690-1704, English import duties increased by 400%, while the 1651-1663 Navigation Acts were a major factor in the Anglo-Dutch Wars. On 6 September 1700, France banned the import of English manufactured goods like cloth and imposed prohibitive duties on a wide range of others. Alignment on reducing the power of France and securing the Protestant succession masked differences on how to achieve them. In general, the Tories favoured a mercantilist strategy of using the Royal Navy to attack French and Spanish trade while protecting and expanding their own; land commitments were viewed as expensive and primarily of benefit to others. The Whigs argued France could not be defeated by seapower alone, making a Continental strategy essential. Britain's financial strength made it the only member of the Alliance able to operate on all fronts against France. While Marlborough was Allied commander in the Low Countries, the Dutch provided much of the manpower and in the early years of the war, strategy in that theatre was subject to their approval. Their priorities were to re-establish and strengthen the Barrier fortresses, retain control of the Scheldt estuary and gain access to trade in the Spanish Empire. Despite being the dominant power within the Holy Roman Empire, Austrian and Imperial interests did not always coincide. The Habsburgs wanted to put Archduke Charles on the throne of an undivided Spanish Monarchy, while their Allies were fighting to prevent either the Bourbons or the Habsburgs from doing so. This divergence and Austria's financial collapse in 1703 meant the campaign in Spain was reliant on Anglo-Dutch naval support and after 1706, English funding. Particularly during the reign of Joseph I, the priority for the Habsburgs was to secure their southern borders from French interventions in northern Italy and suppress Rákóczi's War of Independence in Hungary. Many of the minor German states within the Empire remained neutral, their involvement limited to the provision of mercenaries for others and the larger ones pursued policies independent of either the Empire or Austria. His claim to the Polish crown involved Augustus of Saxony in the Great Northern War, while Bavaria was an ally of France. To ensure his support, Leopold was forced to recognise Frederick of Prussia as King and make Prussia an equal member of the Grand Alliance; as heir to the British throne, Elector George, later George I of Britain was a more reliable source of support but the suspicion remained the interests of Hanover came first. Under Louis XIV, France was the most powerful state in Europe with revenue-generating capacities that far exceeded its rivals. Its geographical position provided enormous tactical flexibility; unlike Austria it had its own navy, and as the campaigns of 1708-10 proved, even under severe pressure it could defend its borders. The Nine Years' War had shown France could not impose its objectives without support but the alliance with Spain and Bavaria made a successful outcome far more likely. Apart from denying an undivided Spanish Monarchy to others, Louis' objectives were to secure his borders with Germany, weaken Austria and increase French commercial strength by access to the Americas trade. Their key objective was as far as possible to preserve an undivided and independent Monarchy. During the 17th century, a series of wars with France drained military and financial resources, with the economy subject to long periods of low productivity and depression. The Spanish monarchy was a personal union of the Crowns of Castile and Aragon, [h] each with very different political cultures. The combination of weak central control, war and a depressed economy meant government finances were in perpetual crisis. During the Nine Years War, Savoy joined the Grand Alliance in 1690 before agreeing a separate peace with France in 1696. The Duchy was strategically important as it provided access to the southern borders of Austria and France. Philip's accession as King of Spain in 1701 placed Savoy between the Spanish-ruled Duchy of Milan and France, while the Savoyard County of Nice and County of Savoy were in Transalpine France and very difficult to defend. Victor Amadeus II allied with France in 1701 but his long-term goal was the acquisition of Milan; neither France, Austria or Spain would relinquish this voluntarily, leaving Britain as the only power that could. After the Royal Navy established control over the Western Mediterranean in 1703, Savoy changed sides. The war was fought over the Spanish-ruled Duchies of Milan and Mantua in Northern Italy considered essential to the security of Austria's southern borders. In 1701, French garrisons occupied Milan and Mantua and Victor Amadeus II, Duke of Savoy, allied with France, his daughter Maria Luisa marrying Philip V. In May 1701, an Imperial army under Prince Eugene of Savoy moved into Northern Italy; by February 1702, victories at Carpi, Chiari and Cremona forced the French behind the Adda river. However, in July 1706 Vendôme and any available forces were sent to reinforce France's northern frontier after the defeat at Ramillies. Reinforced by German auxiliaries, Prince Eugene marched on Turin and the siege was broken by the Battle of Turin on 7 September. Despite a minor French victory at Castiglione, the war in Italy was over; the Convention of Milan in March 1707 confirmed Austria's control of Milan and Mantua, with French troops given free passage back to France for redeployment elsewhere. 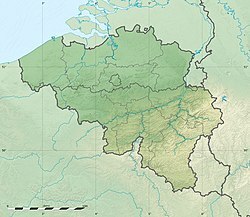 The Low Countries; note location of Prince-Bishopric of Liège (in pink). Red lines show the Pré carré, a double line of fortresses guarding the French border. Holy Roman Empire; main actions occurred along the Moselle, Rhine and Upper Danube. The first objective for the Grand Alliance in this theatre was to secure the Dutch frontiers, threatened by the alliance between France, Bavaria and Joseph Clemens of Bavaria, ruler of Liège and Cologne. During 1702, the Barrier fortresses were retaken along with Kaiserswerth, Venlo, Roermond and Liège. The 1703 campaign was marred by Allied conflicts over strategy; they failed to take Antwerp, while the Dutch defeat at Ekeren in June led to bitter recriminations. On the Upper Rhine, Imperial forces under Louis of Baden remained on the defensive, although they took Landau in 1702. Over the course of 1703, French victories at Friedlingen, Höchstädt and Speyerbach with the capture of Kehl, Breisach and Landau directly threatened Vienna. Allied efforts to exploit their victory in 1705 foundered on poor co-ordination, tactical disputes and command rivalries, while Leopold's ruthless rule in Bavaria caused a brief but vicious peasant revolt. In May 1706 an Allied force under Marlborough shattered a French army at the Battle of Ramillies; as French numbers had been maximised by stripping garrisons from the Spanish Netherlands, the entire province fell to the Allies in under two weeks. This eliminated French offensive capabilities for the rest of the war but despite taking key strongpoints like Lille, the Allies were unable to make a decisive breach in the French frontiers. An internal revolt in early 1708 led to the temporary loss of parts of the Spanish Netherlands; this was restored by victory at Oudenarde in July but the overall position remained largely unchanged from 1706. Peninsular Spain, showing Crowns of Castile and Aragon. Victory in Spain was vital if Archduke Charles were to win the throne but the Habsburgs viewed Northern Italy and suppressing the Hungarian revolt as higher priorities. Anglo-Dutch involvement was driven by the mercantilist strategy of securing trade in the Mediterranean and gaining commercial access to the Spanish Empire. This made Spain more important to the Dutch and English than Austria and dependent on their support, a conflict that was never really solved. Spain was a union between the Crowns of Castile and Aragon, [l] with Aragon then divided into the Principality of Catalonia plus the Kingdoms of Aragon, Valencia, Majorca, Sicily, Naples and Sardinia. Majorca, Naples, Sicily and Sardinia declared for Philip in 1701; a mixture of anti-Castilian and anti-French sentiment meant Catalonia, most of Aragon and Valencia supported Archduke Charles but this simplifies a very complex reality. Almansa, April 1707; Bourbon victory was a serious setback for the Allies in Spain. Anglo-Dutch strategy required a naval base in the area; the attack on Cádiz in September 1702 ended in failure but victory at Vigo Bay in October persuaded Peter II of Portugal to abandon the Bourbons and join the Grand Alliance in May 1703. This gave the Allies access to Lisbon and in March 1704, the newly crowned Charles III of Spain arrived in Portugal to begin a land campaign. In May 1704, a Bourbon army won a series of minor victories along the Spain/Portugal border, offset by the Allied capture of Gibraltar, a vital strategic possession. 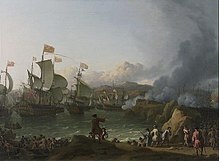 Attempts to retake it were defeated at the naval Battle of Málaga in August, with a land siege being abandoned in April 1705. In June 1705, the 'Pact of Genoa' between Catalan representatives and England opened a second front in the north-east; the loss of Barcelona and Valencia left Toulon as the only major port available to the Bourbons in the Western Mediterranean. Philip tried to retake Barcelona in May 1706 but was repulsed, his absence allowing an Allied force from Portugal to enter Madrid and Zaragossa. The Allies could not be resupplied so far from their bases and had to withdraw; by November, Philip controlled Castile, Murcia and parts of Valencia. Attempts to regain the initiative in 1707 ended with Allied defeats at Almansa in April and Toulon in August, once again restricting Archduke Charles to Catalonia. The British capture of Menorca in 1708 combined with possession of Gibraltar gave them control of the Western Mediterranean. By the end of 1708, British objectives had largely been achieved, Portugal and the Dutch Republic were financially exhausted while Austria refused to commit significant resources to putting Charles on the throne of Spain. The close links between war and trade meant conflict extended beyond Europe, particularly in North America, where it is known as Queen Anne's War and the West Indies, which produced sugar, then hugely profitable. In addition, there were minor trade conflicts in South America, India and Asia; the financial strains of war particularly affected the Dutch East India Company, as it was a huge drain on scarce naval resources. 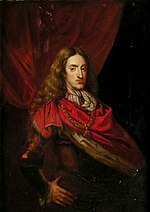 Related conflicts include Rákóczi's War of Independence in Hungary, which was funded by France and a serious concern for the Habsburgs throughout the war. In South-Eastern France, Britain funded the Huguenot 1704-1710 Camisard rebellion; one objective of the 1707 campaign in Northern Italy and Southern France was to support this revolt, one of a series that began in the 1620s. By the end of 1708, the war had reached stalemate; the French had withdrawn from Northern Italy, with Austria gaining the Spanish possessions of Milan and Naples. In the Low Countries, Ramillies and Oudenarde gave the Maritime Powers control of the Spanish Netherlands and secured the borders of the Dutch Republic; in the Mediterranean, Britain's Royal Navy had achieved naval supremacy and permanent bases in Gibraltar and Menorca. However, France's frontiers remained largely intact while the Grand Alliance had been unable to make any lasting progress in Spain, where Philip proved to be far more popular with the Spanish than the Austrian candidate Archduke Charles. Many of the objectives originally set out by the Grand Alliance in 1701 had been achieved but the victories of 1706 made them overconfident, resulting in the continuation of a war most participants wanted to end but could not. Malplaquet 1709: ostensibly an Allied victory, the losses shocked Europe and increased the desire for peace. France began peace talks with the Dutch in 1705, viewing them as the most likely to favour a quick end to the war; Ramillies increased this by removing the direct military threat to the Dutch Republic and highlighting Allied differences on the Spanish Netherlands. Ultimately, these made little progress since the Allies had agreed to negotiate jointly, not separately and they were unable to reach internal agreement on the terms. The winter of 1708 in Europe was one of the coldest on record, with widespread crop failures and famine exacerbated in France and Spain by a British naval blockade of grain imports. The French re opened talks and in May 1709, the Allies presented the terms known as the Preliminaries of Hague; they included the demand Philip cede his throne to Archduke Charles without compensation and France assist in his removal by force if this was not done within two months. This assumed Philip would abdicate on request and the Spanish accept Archduke Charles while seriously under-estimating France's ability to resist. Louis was willing to abandon Spain but not make war on his own grandson; when it became public, the demand was considered so offensive it strengthened French resolve to fight on. Marlborough now launched an offensive in Northern France which led to the Battle of Malplaquet on 11 September 1709 between an Allied army of 86,000 and a French of 75,000. Victory cost the Allies over 20,000 casualties, demonstrated the fighting ability of the French army remained intact and increased war-weariness both in Britain and the Dutch Republic, who suffered heavy losses. This was compounded by the Bourbon recapture of Alicante in April and the defeat of an Anglo-Portuguese force at La Gudina in May. Lack of progress accentuated the reality that the Allies no longer shared clear objectives, highlighted by Dutch exclusion from an agreement between Britain and Archduke Charles for trading rights in Spanish America. The British government compensated with the 1709 First Barrier Treaty; this gave the Dutch effective control of the Spanish Netherlands but was seen as detrimental to British commerce and increased domestic opposition. The Whigs had won the 1708 British general election by arguing military victory was the quickest road to peace but failure in France was followed by the same in Spain. Archduke Charles re-entered Madrid in 1710 after victories in the Battle of Almenar and Battle of Saragossa, but lack of supplies forced him to retreat; 3,500 British troops surrendered at Brihuega on 8 December and while Villaviciosa on 10 December was a tactical draw, it confirmed Bourbon control of Spain. British financial power was essential for the Allies to continue but the pro-peace Tories won a landslide victory in the 1710 British election. 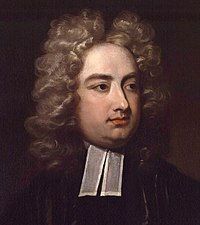 Jonathan Swift; Tory satirist and creator of the first sustained campaign in moulding British public opinion. Negotiations resumed in March 1710 at Geertruidenberg but broke down due to the continued insistence France expel Philip by force if he refused to abdicate. The new British government confirmed its commitment to the war to prevent a credit crisis and reassure its Allies; despite the capture of Bouchain in September, decisive victory in Northern France continued to elude the Allies while an expedition against Quebec in French North America ended in disaster. The British political situation was simplified when Emperor Joseph died in April 1711 and Archduke Charles elected Emperor in October. The purpose of continuing the war was unclear, since union of Spain with Austria was as unwelcome as one with France and as the Tory propagandist Jonathan Swift pointed out, the 1701 Treaty made no reference to removing Philip. [m] Even the Whigs had grown frustrated by the Habsburg tendency to put their interests first e.g. the 1707 Convention of Milan or the diversion of resources to capturing Naples in 1707. The British secretly negotiated peace terms directly with France leading to the signing of the Preliminary Articles of London on 8 October 1711. [n] These included French acceptance of the Act of Settlement and a guarantee that the French and Spanish crowns would remain separate, while France undertook to ensure Spain ceded Gibraltar and Menorca and award the Asiento to Britain for 30 years. Together with a commitment to the Dutch Barrier, these would form the basis of the Treaty of Utrecht. Despite their annoyance at being excluded from the Anglo-French negotiations, the Dutch were financially exhausted by the enormous cost of the war and could not continue without British support. Charles VI rejected the idea of a peace conference; once the Dutch agreed to support it, he reluctantly agreed rather than be isolated but Habsburg opposition to the Treaty continued. Within weeks of the conference opening, events threatened the basis of the peace agreed between Britain and France. First, the French presented proposals awarding the Spanish Netherlands to Max Emmanuel of Bavaria and a minimal Barrier, leaving the Dutch with little to show for their huge investment of money and men. Second, a series of deaths left Louis XIV's two year old great-grandson, the future Louis XV as heir, making Philip next in line and his immediate renunciation imperative. Prince Eugene captured Le Quesnoy in June and besieged Landrecies but was defeated at Denain on 24 July; the French went on to recapture Le Quesnoy and many towns lost in previous years, including Marchines, Douai and Bouchain. The Dutch had finally reached the end of their willingness and ability to continue the war. On 6 June, Philip had announced his renunciation of the French throne; the British Tory government now offered the Dutch a revised Barrier Treaty, replacing that of 1709 which they rejected as overly generous. It was a significant improvement on the 1697 Barrier but ultimately subject to Austrian approval and the final terms were less beneficial. Charles withdrew from the Conference when France insisted on an Austrian guarantee they would not seek to acquire Mantua or Mirandola; he was supported in this by George, Elector of Hanover, who wanted France to withdraw support for the Stuart heir James Francis. As a result, neither Austria or the Empire signed the Treaty of Utrecht of 11 April 1713 between France and the other Allies; Spain made peace with the Dutch in June, then Savoy and Britain on 13 July 1713. Fighting continued on the Rhine but Austria was financially exhausted and after the loss of Landau and Freiburg in November 1713, Charles came to terms. The Treaty of Rastatt on 7 March 1714 confirmed Austrian gains in Italy, returned Breisach, Kehl and Freiburg, ended French support for the Hungarian revolt and agreed terms for the Dutch Barrier fortresses. Charles abandoned his claim to Strasbourg and Alsace and agreed to the restoration of the Wittelsbach Electors of Bavaria and Cologne, Max Emmanuel and Joseph Clemens. Article XIX of the treaty transferred sovereignty over the Spanish Netherlands to Austria. On 7 September, the Holy Roman Empire joined the agreement by the Treaty of Baden; although Catalonia and Majorca were not finally subdued by the Bourbons until June 1715, the war was over. The Royal Navy destroys a Spanish fleet off Sicily, Cape Passaro, August 1718. The Peace of Utrecht stipulated that "because of the great danger which threatened the liberty and safety of all Europe, from the too close conjunction of the kingdoms of Spain and France, [...] one and the same person should never become King of both kingdoms." Some historians view this as a key point in the evolution of the modern nation state, while legal historian Randall Lesaffer also argues that it marks a significant milestone in the concept of collective security. Britain is usually seen as the main beneficiary of Utrecht ; marking its rise to becoming the primary European commercial power. It established naval superiority over its competitors, controlled the strategic Mediterranean ports of Gibraltar and Menorca, and gained commercial access to Spanish America. France accepted the Protestant succession, ensuring a smooth inheritance by George I in August 1714 and ended support for the Stuarts under the 1716 Anglo-French Treaty. Lastly, the war left all the participants with unprecedented levels of government debt but only Britain successfully financed it. Philip was confirmed as King of Spain, which retained its independence and the majority of its Empire but ceded the Spanish Netherlands and most of their Italian possessions. The 1707 Nueva Planta decrees transferred powers to Madrid and largely abolished regional political structures. [p] These reforms enabled Spain to recover remarkably quickly and only British naval power prevented them regaining Naples and Sicily in 1718. Despite its failure in Spain, Austria secured its position in Italy and Hungary and acquired the bulk of the Spanish Netherlands. Even after reimbursing the Dutch for most of the expenses associated with their Barrier, the increased tax revenues helped fund a significant expansion of Austrian military forces. The acquisition of maritime territories in the Netherlands and Italy increased the potential for conflict in an area where Austria had traditionally relied on others and Spain recaptured Sicily and Naples during the War of the Polish Succession in 1734. Victory in the Austro-Turkish War of 1716–18 continued the trend of Habsburg focus shifting away from Germany and into South-East Europe. Their hold over the Empire weakened, with Bavaria, Hanover, Prussia and Saxony increasingly acting as independent powers; in 1742, Charles of Bavaria became the first non-Habsburg Emperor in over 300 years. Historian Robert A. Kann argues Austria's failure to fully benefit from its investment in the war was due to Charles VI's stubbornness and dynastic pride. Ensuring his daughter's succession in preference to his niece via the 1713 Pragmatic Sanction, drew Austria into peripheral conflicts like the 1733-1735 War of the Polish Succession, where most of the actual fighting took place on Austrian territory. The Dutch Republic ended the war effectively bankrupt and the 1715 Barrier Treaty that had cost so much proved largely illusory. The forts were quickly overrun in 1740, Britain's promise of military support against an aggressor proving to be far more effective. The damage suffered by the Dutch merchant navy permanently affected their commercial and political strength and it was superseded by Britain as the pre-eminent European mercantile power. Louis XIV died on 1 September 1715, with his five-year-old great-grandson reigning as Louis XV until 1774; on his deathbed, he is alleged to have admitted 'I have loved war too well.' True or not, while the final settlement was far more favourable than the Allied offer of 1709, it is hard to see what Louis gained that had not already been achieved through diplomacy by February 1701. France remained strong but could not maintain its former dominance, particularly in relation to Britain; concern over this relative decline in military and economic terms was an underlying cause of the War of the Austrian Succession. Wider implications include the beginning of the rise of Prussia and Savoy while many of the participants were involved in the 1700-1721 the Great Northern War, with Russia becoming a European power for the first time as a result. Finally, while colonial conflicts were relatively minor and largely confined to the North American theatre or the so-called Queen Anne's War, they were to become a key element in future wars. Wikimedia Commons has media related to War of the Spanish Succession. ^ The Habsburgs were rulers of Austria and Hungary in their own right; Emperor of the Holy Roman Empire was technically an elected position but had been held by the Habsburgs since 1438. ^ Until 1707, England and Scotland were separate countries under one monarch ie William but Treaties were signed by the King of Great Britain. ^ Their main objection was France gaining Sicily, an important link in the lucrative Levant trade. ^ England and Scotland were separate kingdoms until 1707 but the Treaty was signed by William as King of Great Britain. ^ Similar to the North African campaigns of 1940-42 where the British and German/Italians fought along the same coastal strip. ^ The Crown of Aragon was divided into the Kingdoms of Aragon, Catalonia, Valencia, Majorca, Naples, Sicily, Malta and Sardinia. ^ Without significant naval forces of its own, Austria could not take Sicily and the Kingdom was recaptured by Spain in 1734. ^ These became part of France in 1860. ^ Max Emmanuel remained a French general, fighting in many of the battles of 1705-08. ^ Similar to England and Scotland. ^ The most famous being his pamphlet titled The Conduct of the Allies. ^ Also known as the Mesnager Convention. ^ George I regarded those involved with deep suspicion and hostility; Ormonde, Henry St John, Viscount Bolingbroke, alleged architect of the Orders and others were effectively driven into exile and became prominent Jacobites. ^ Aragon and Valencia were brought into the system in 1712, Catalonia and Majorca following in 1767. ^ a b c d e f g Clodfelter 2017, p. 73. ^ Falkner, James (2015). The War of the Spanish Succession (Kindle ed.). 4148-4181: Pen and Sword Military. ASIN B0189PTWZG. ^ Hochedlinger, Michael (2003). Austria's Wars of Emergence, 1683-1797. Routledge. p. 171. ISBN 0582290848. ^ Frey, Linda, Frey, Marsha (1995). The Treaties of the War of the Spanish Succession: An Historical and Critical Dictionary. Greenwood. pp. 191–192. ISBN 978-0313278846. ^ Childs, John (1991). The Nine Years' War and the British Army, 1688-1697: The Operations in the Low Countries (2013 ed.). Manchester University Press. p. 1. ISBN 0719089964. ^ I. D. White, "Rural Settlement 1500–1770", in M. Lynch, ed., Oxford Companion to Scottish History (Oxford: Oxford University Press, 2011), ISBN 0199693056, pp. 542–3. ^ Frey, Linda; Frey, Marsha, eds. (1995). The Treaties of the War of the Spanish Succession: An Historical and Critical Dictionary. Greenwood. p. 389. ISBN 978-0313278846. ^ McKay, Derek, Scott, HM (1983). The Rise of the Great Powers 1648 - 1815 (The Modern European State System). Routledge. pp. 54–55. ISBN 978-0582485549. ^ Ingrao, Charles (2000). The Habsburg Monarchy, 1618–1815 (2010 ed.). Cambridge University Press. p. 105. ISBN 978-0521785051. ^ McKay, Derek, Scott, HM (1983). The Rise of the Great Powers 1648–1815 (The Modern European State System). Routledge. p. 55. ISBN 978-0582485549. ^ Kamen, Henry (2001). Philip V of Spain: The King Who Reigned Twice. Yale University Press. p. 3. ISBN 978-0300180541. ^ Gregg, Edward (1980). Queen Anne (Revised) (The English Monarchs Series) (2001 ed.). Yale University Press. p. 126. ISBN 978-0300090246. ^ Somerset, Anne (2012). Queen Anne; the Politics of Passion. Harper. p. 166. ISBN 978-0007203765. ^ Thompson, RT (1973). Lothar Franz von Schönborn and the Diplomacy of the Electorate of Mainz:. Springer. pp. 158–160. ISBN 978-9024713462. ^ Israel, Jonathan (1989). Dutch Primacy in World Trade, 1585-1740 (1990 ed.). Oxford University Press. pp. 197–199. ISBN 978-0198211396. ^ Somerset, Anne (2012). Queen Anne; the Politics of Passion. Harper. p. 167. ISBN 978-0007203765. ^ Somerset, Anne (2012). Queen Anne; the Politics of Passion. Harper. p. 168. ISBN 978-0007203765. ^ Wolf, John (1968). Louis XIV (1974 ed.). WW Norton & Co. p. 514. ISBN 978-0393007534. ^ Rothbard, Murray. "Mercantilism as the Economic Side of Absolutism". Mises.org. Good summary of the concept. Retrieved 7 April 2018. ^ Schaeper, Thomas (March 1986). "French and English Trade after Utrecht". Journal for Eighteenth Century Studies. 9 (1): 1. doi:10.1111/j.1754-0208.1986.tb00117.x. ^ Childs, John (1991). The Nine Years' War and the British Army, 1688-1697: The Operations in the Low Countries (2013 ed.). Manchester University Press. p. 2. ISBN 978-0719089961. ^ Shinsuke, Satsuma (2013). Britain and Colonial Maritime War in the Early Eighteenth Century. Overview of arguments used: Boydell Press. p. 37 passim. ISBN 978-1843838623. ^ Ingrao, Charles (1979). In Quest & Crisis; Emperor Joseph I and the Habsburg Monarchy (2010 ed.). Cambridge University Press. p. 220. ISBN 978-0521785051. ^ Storrs, Christopher. "The Decline of Spain in the Seventeenth Century" (PDF). State Papers Online. Gale;Cengage Learning. Retrieved 7 April 2018. ^ Jon Cowans (2003). Modern Spain: A Documentary History. U. of Pennsylvania Press. pp. 26–27. ISBN 978-0-8122-1846-6. ^ Lynn, John (1999). The Wars of Louis XIV, 1667-1714 (Modern Wars In Perspective). Longman. pp. 270–271. ISBN 978-0582056299. ^ Falkner, James (2015). The War of the Spanish Succession 1701-1714 (Kindle ed.). 1302: Pen and Sword. ISBN 9781473872905. ^ Sundstrom, Roy A (1992). Sidney Godolphin: Servant of the State. EDS Publications Ltd. p. 196. ISBN 978-0874134384. ^ Symcox, Geoffrey (1985). Victor Amadeus; Absolutism in the Savoyard State, 1675-1730. University of California Press. p. 155. ISBN 978-0520049741. ^ Holmes, Richard (2008). Marlborough: England's Fragile Genius. Harper. pp. 347–349. ISBN 978-0007225729. ^ Francis, AD (May 1965). "Portugal and the Grand Alliance". Historical Research. 38 (97): 71–93. doi:10.1111/j.1468-2281.1965.tb01638.x. ^ Bromley, JS (1970). The New Cambridge Modern History: Volume 6, The Rise of Great Britain and Russia (1979 ed.). Cambridge University Press. p. 446. ISBN 978-0521293969. ^ Kamen, Henry (2001). Philip V of Spain: The King Who Reigned Twice. Yale University Press. pp. 70–72. ISBN 978-0300180541. ^ Simms, Brendan (2008). Three Victories and a Defeat: The Rise and Fall of the First British Empire, 1714–1783. Penguin. pp. 60–64. ISBN 978-0140289848. ^ Bromley, JS (1970). The New Cambridge Modern History: Volume 6, The Rise of Great Britain and Russia (1979 ed.). Cambridge University Press. pp. 459–460. ISBN 978-0521293969. ^ Gregg, Edward (1980). Queen Anne (Revised) (The English Monarchs Series) (2001 ed.). Yale University Press. p. 354. ISBN 978-0300090246. ^ Holmes, Richard (2008). Marlborough: England's Fragile Genius. Harper. p. 462. ISBN 978-0007225729. ^ Myers (1917). "Violation of Treaties: Bad Faith, Nonexecution and Disregard". The American Journal of International Law. 11 (4): 799–829 passim. ^ Klaus Malettke, Les relations entre la France et le Saint-Empire au XVIIe siècle, Honoré Champion, Paris, 2001, p. 645–647. ^ Frey, Linda; Frey, Marsha, eds. (1995). The Treaties of the War of the Spanish Succession: An Historical and Critical Dictionary. Greenwood. pp. 374–375. ISBN 978-0313278846. ^ Vives Vi, Jaime (1969). An Economic History of Spain. Princeton University Press. p. 591. ISBN 978-0691051659. Retrieved 8 April 2018. ^ Anderson, MS (1995). The War of Austrian Succession 1740-1748. Routledge. pp. 7–11. ISBN 978-0582059504. ^ Robert A. Kann, A History of the Habsburg Empire, 1526–1918, University of California Press, 1980 (1974), p. 88–89. Clark, George. From the Nine Years' War to the War of the Spanish Succession in J. S. Bromley (ed.) The New Cambridge Modern History, VI, 381–409. Falkner, James. The War of the Spanish Succession 1701 – 1714 (2015). Godinho, Vitorino Magalhães. Portugal and Her Empire, 1680–1720 in J. S. Bromley (ed.) The New Cambridge Modern History, VI, 509–40. ____ "Commerce, Religion, and World Politics: Sephardi Jewry and the Struggle for the Spanish Succession (1700–1714)" in Diasporas within a Diaspora: Jews, Crypto-Jews, and the World of Maritime Empires (1540–1740). Leiden: Brill 2002, pp. 533–566. ISBN 90-04-12765-8. Whaley, Joachim. Germany and the Holy Roman Empire, Volume II: The Peace of Westphalia to the Dissolution of the Reich, 1648–1806. Oxford University Press, 2012.